It’s a very fair question to ask which I think always should be answered in the context of the customer and their specific needs. Bitrate’s partners and customers are predominantly in Africa. So, to answer this question in the context of our continent, we have to understand the many challenges customers in Africa face and have to successfully overcome. Africa is embracing the internet age at a rapid pace. Mobile networks are providing easy access to millions of subscribers. The challenge is that IT security is unfortunately is not being implemented at the same pace as internet connectivity and usually only sub-standard information security controls are initially considered. This practice places customers in Africa at substantial risk and increases the risk of a successful breach or information compromise. There is no doubt that the internet as we know it is constantly under attack, its availability is at a risk. We have to find ways for the African economy to defend against malicious attack and deal with this challenge in a successful manner. Being a developing continent, the cost of implementing good IT Security is often a barrier for organisations and this may be difficult to overcome in some instances. Bandwidth in Africa remains expensive in relation to other developing economies. This is often due to high infrastructure costs and other barriers to entry which may be a reality for a number of years still. Some of the countries within Africa are implementing more and more governance and compliance related requirements relating to information and IT security. Examples of this include, the King IV, Electronic Communications Transactions Act and Protection of Personal Information (POPI) Act. Many organisations are still required to implement compliance with GDPR as they store information about customers residing in Europe and other continents. User and Application visibility is often ignored due to the prohibitive cost of user and application monitoring. These are only a few of the many issues that relate to Information and IT security that should be considered by enterprises throughout Africa. Some of these challenges do however involve major challenges for some organisations that need to be overcome in order to allow them to successfully meet compliance requirements and other business objectives. The Hillstone Next Generation Firewalls are on the Gartner Magic Quadrant and have been tested by NSS Labs with great results. It is very important for Africa to have access to Next Generation Firewalls that are affordable and effective. For more information on Next Generation Firewalls see the E-Series and T-Series range. The Hillstone Networks Next Generation Firewalls includes a huge amount of functionality in their solution such as, Advanced Threat Protection, Abnormal Behavior Detection, URL Filtering, AntiVirus, QoS, Link and Server Load Balancing and Cloud Sandboxing with a lot more exciting functionality added. See the article “The Best Firewall” for more info. Hillstone Networks’s ultimate purpose is to give maximum protection to their customers at a fair price. Typically, Hillstone Networks will offer their carrier grade firewalls at 30 to 40 % less than the same quality firewalls of their competitors. With Hillstone Networks Intelligent Next Generation Firewall, there is much more functionality and protection for the organisation at a cost that is still competitive. At no extra cost to the customer, Hillstone Networks adds additional functionality into their firewalls that helps reduce overall costs for their customer. Onboard Link Load Balancing and Server Load Balancing means the customer does not have to purchase these as extra solutions. Hillstone Networks also includes full routing support so customers can eliminate the requirement for a router. Note that Hillstone Networks also includes carrier grade NAT which reduces the complexity of configuration yet again. Considering this, Hillstone Networks can provide a great total cost of ownership for customers throughout Africa. Bandwidth usage remains expensive in Africa and customers are looking for ways to make better use of their bandwidth. Hillstone Networks achieves this in multiple ways. Firstly, the traffic traversing the Firewall is given full visibility through the user interface with full control of both users and applications. Non-business related applications can be offloaded or given less priority. Hillstone’s Carrier grade QoS can also be used prioritize traffic more efficiently. Further traffic shaping can also be implemented on the Firewall. Compliance and Governance is achieved with Hillstone Networks through comprehensive reports which help prove protection of end users and sensitive personal information at rest or in active transactions. As mentioned above, user and application monitoring is available on the Hillstone Firewall GUI. The Hillstone Networks Firewall further provides simple to read reports helping administrators decide the best actions to optimize bandwidth utilization. 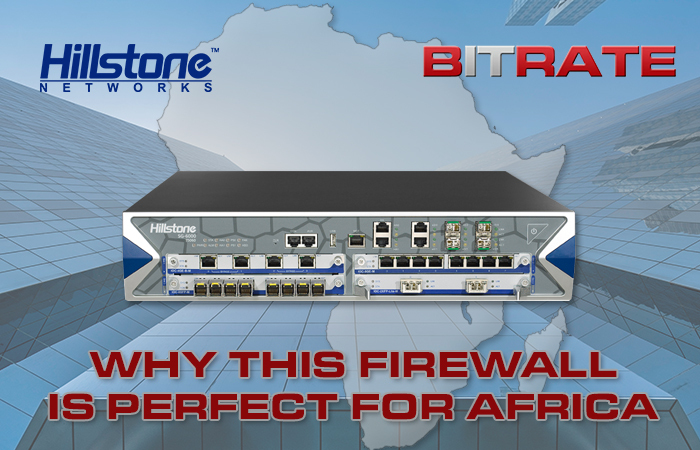 In conclusion, the range of Hillstone Networks Firewalls provides the firewall solution for Africa by bringing down the total cost of ownership at the same time as adding best of breed IT and Information security. This firewall is packed with extra functionality that helps with further cost reductions in infrastructure and monitoring solutions.